Sudanese police Tuesday fired tear gas at crowds of demonstrators chanting “Peace, justice, freedom” in the capital, a day after President Omar al-Bashir insisted protests will not lead to a change in government. At least 24 people have died in the protests, which swiftly turned into nationwide rallies in which demonstrators have called on Bashir to step down. On Tuesday, crowds of protesters took to the streets in the capital’s business district of El-Kalakla chanting “Peace, freedom, justice” and “We are fighters, we will achieve our mission,” witnesses said. Men and women, carrying the Sudanese flag and banners declaring “Revolution is the people’s choice,” marched as riot police moved in to disperse them with tear gas, the witnesses said. Protesters also staged a demonstration in Omdurman, the twin city of Khartoum across the Nile, but it ended swiftly. As darkness fell, the protesters broke up into groups and staged small rallies in streets and alleys of El-Kalakla as police chased them, witnesses said, adding the demonstration later ended. 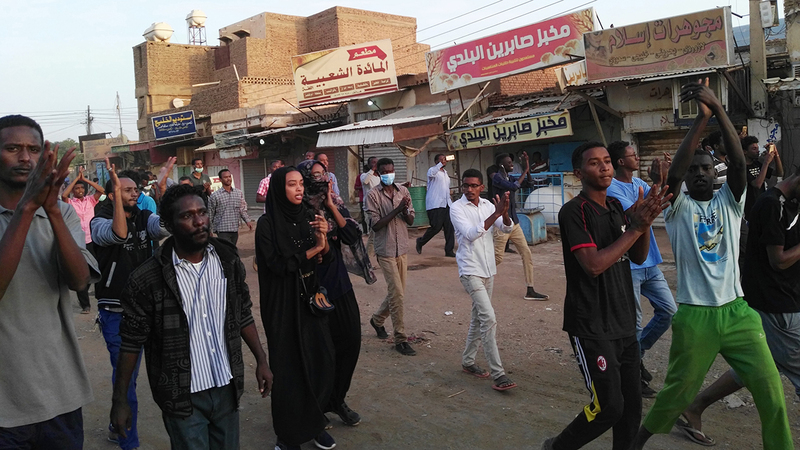 Hours before the protests began, authorities had deployed police in some areas of Khartoum including in El-Kalakla and in parts of Omdurman, but reinforcements swiftly joined riot police after protesters came out onto the streets. The Sudanese Professionals’ Association that is spearheading the rallies has urged protesters to continue with their near daily demonstrations this week, calling it the “Week of Uprising”. Tuesday’s demonstrations came a day after Bashir insisted protesters would fail in their goal. “Demonstrations will not change the government,” Bashir told a rally of supporters in Niyala, the capital of South Darfur state. His supporters responded to him with chants of “Stay, stay”. Protesters had staged rallies on Sunday in Niyala and El-Fasher, the capital of North Darfur state — the first such anti-government demonstrations to be held in the war-ravaged region. Although Darfur has been largely calm since last year, the region has been torn by a brutal conflict that erupted in 2003 when ethnic minority rebels took up arms against Khartoum’s Arab-dominated government, accusing it of economic and political marginalisation. Bashir has been charged by The Hague-based International Criminal Court (ICC) with genocide and war crimes allegedly committed in Darfur. Rights groups say more than 1,000 people have been arrested in a crackdown by security agents since the protests began, including opposition leaders, activists and journalists as well as demonstrators.